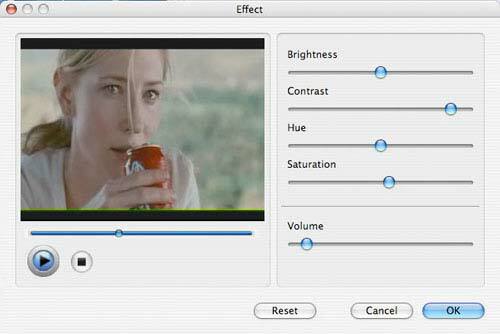 A lot of iPhone users are looking for methods to convert video to iPhone on Mac. iPhone Video Converter for Mac is specially developed for Mac users and iPhone fans and bestows you a multifunctional video editor. It has a very simple Mac-style interface that guides you to convert videos to iPhone without the hassle of figuring out how to use the program. Notice: The trail version just permits you to experience some of the powerful functions. Only up to 10 seconds of each file can be converted and clip function is unavaiable. If you want to enjoy 100% features of this intelligent iPhone Ringtone Maker software, just $29.00, you can get a full one! You can select an output format for your iPhone and specify a destination on your computer to save the output files. Note: Set new parameters by clicking Settings button. If you want to merge all added video files into one file, check option. If you are not content with the original effect, you can click Effect icon to set the video brightness, contrast, saturation, and audio volume. Click and then you can go out for a walk or take a nap, the conversion may be finished when coming back. Copyright© 2009 Mac DVD to iPhone Converter. All rights reserved.